If you are looking for a quality, pre-owned mul tihull, then be sure to consider buying your boat from our Multihull Solutions Tahiti Sales Centre and begin your grand adventure in one of the most picturesque cruising grounds in the world! A stress-free buying experience: When you buy a boat from us in Tahiti, the entire process is handled by our professional Multihull Solutions representatives to make the experience entirely enjoyable and stress-free for you. All sales documents are in English and your deposit is securely held in our Multihull Solutions Australian escrow account. A water sports paradise: French Polynesia boasts some of the best spots worldwide for water sports. From kitesurfing to heavy wave surfing to spear fishing, you’re guaranteed to have the experience of your life. Not only are the spots incredibly beautiful but they are also empty: most atolls are scarcely inhabited and there are no charter boats. The charter industry is concentrated in a few islands and the rest (more than 200) are the playground of offshore sailors. There is no mass market tourism in Polynesia. This is island life at its best. 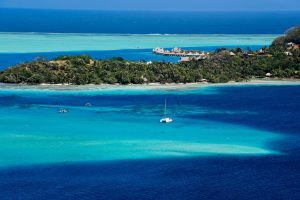 An unforgettable French Polynesian experience: We ensure all of our clients enjoy an incredible experience when they visit French Polynesia to inspect a boat to purchase. Multihull Solutions will help you find the best accommodation in Tahiti, and our local representatives will collect you at the airport and organise all transfers for you to inspect as many boats for sale as you like. All you need to do is book your flights! We will also provide suggestions for sightseeing tours and activities, or you can just spend your spare time relaxing in our spectacular islands. Technical Expertise: From hiring a certified skipper for your sea trials to organising a professional survey, Multihull Solutions takes care of all the technical aspects of your purchase process. Once you’ve finalised the purchase of your new multihull, we can also manage the preparation of your boat for its long-distance voyage utilizing our expansive network of highly qualified contractors. Learning the Ropes: If you want to brush up on your skills or learn the ropes from scratch, we can help you become confident and competent to handle your new multihull. We work with an array of certified skippers who have extensive experience with myriad multihull makes and models. Whether you want a single day of refresher training or a longer intensive sail training program, we can match you with the perfect skipper. Smooth deliveries:If you wish to have your new boat delivered and imported to any location around the world, Multihull Solutions takes care of everything from appointing highly qualified and experienced skipper and crew through to managing the intricacies of the importation and customs processes. Easy importation: Multihull Solutions will provide all the relevant information and details of customs contacts so you are fully aware of all relevant import taxes and duties that may apply upon bringing your new boat into your home port. Preparation for Provisioning: Multihull Solutions can provide comprehensive information on the many marinas, dry docks and provisioning resources that exist in Tahiti and throughout its surrounding islands so you can properly plan your cruising ventures when it’s time to depart. The local government is committed to continually improving the marine industry’s infrastructure and making it even easier and more enjoyable for cruising sailors to come and go. An extended tropical holiday: There is no rush to leave Tahiti’s spectacular waterways and foreign boats are permitted to stay in French Polynesian waters free of taxes for up to three years! This will give you plenty of time to discover and explore our hundreds of breathtaking atolls and islands. Cruise some of the most beautiful places in the world: While we maintain Polynesia is the jewel in the Pacific’s crown, when you choose to purchase a multihull in Tahiti you will also be able to experience the majestic beauty of the South Pacific isles from Polynesia to Fiji, Tonga, Cook, Vanuatu, all on a nice downwind journey to Australia. It’s a sailor’s dream come true! Contact our Multihull Solutions Tahiti team for more information about how we can help you source the boat that’s right for you. Next Top TipSailing at its level best – monohull or multihull?